Breyer model horses, which begin as artist’s sculptures, are handcrafted and hand-painted with airbrushes and paintbrushes – a process which is still done by human hands, not machines. When Thunder, the Denver Broncos mascot opens each home game at Sports Authority field in Denver, Colorado, more than 76,125 fans show their Love of Thunder with resounding Mile-High cheers and applause. With each scoring drive, Thunder engages the crowd running full-stride from the south end zone down the center of the field to the north. 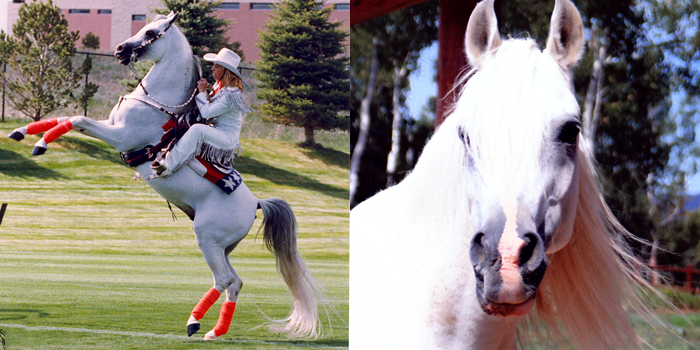 Winning multiple show champion awards, Sharon explains that the first Thunder was a stallion. “He was smart – a lovable handful with a hilarious sense of humor.” Thunder I led the Bronco charge during the inaugural ten seasons and represented the team during Elway-led wins in Super Bowls XXXll and XXXlll. 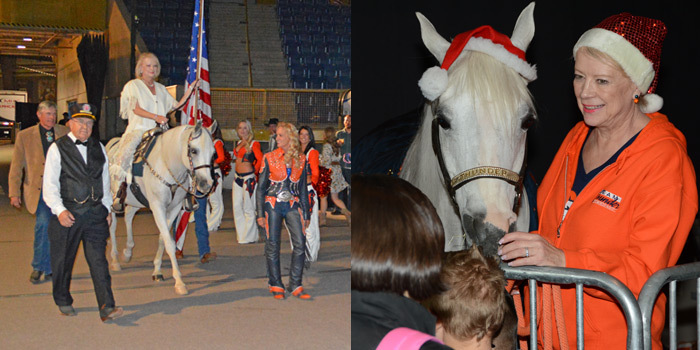 Thunder II, a gelding nicknamed “Dos”, rode as the mascot through the 2012 season. 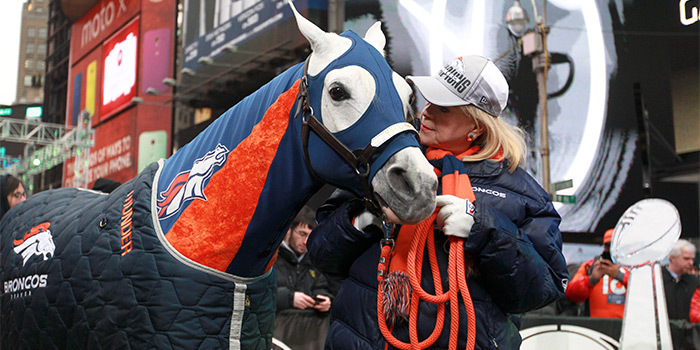 For the past three years, Thunder III also known as “Shadow” was appointed with mascot duty and has led the Broncos onto the field in Super Bowls XLVlll and 50. Rider and trainer Ann Judge has saddled-up Thunder I, II and III. Together, adorned in blue and orange, the duo adds full-speed elegance to the hard-nosed game of football. Judge commands the scoring sprint while waving a flag and saluting the crowd…yes, all without holding onto the reigns. This ceremonial full-field run signifies a Bronco scoring drive. Sharon Magness Blake and Ernie Blake are Chief Executive Owners and the force behind every element that continues to make the Bronco’s mascot possible for all who enthusiastically embrace the Thunder Spirit. Together, they orchestrate countless preparations behind the scenes in addition carrying out pre-game and on-field details that allow us to enjoy the NFL’s finest mascot. Accompanied by Team Thunder, the Arabian mascot requires a support crew of professionals. “We have a great team on the field,” Ann says. “In addition to Sharon and myself, there is Sharon’s husband, Ernie who clears the pathway on the field as well as the sidelines between cameras and players.” Team Thunder is completed with Rick Holman who serves as bodyguard. Also, Rudy Mendiola and David Blake take a position on each side of Thunder’s hindquarters while in the end zone. They steady the horse, keep field staff at a distance and … "manage the shovel in case of falling ‘meadow muffins.’"
Since 1994, Western Fantasy has raised one million annually for Volunteers of America. Thunder also hosts an annual Christmas party for 300 children from local Boys and Girls Club organizations, complete with a kid-style lunch, pictures with the mascot, face painting, balloon art fun and gifts from Santa. Fans, players and game day staff alike, stand in awe watching Thunder run. 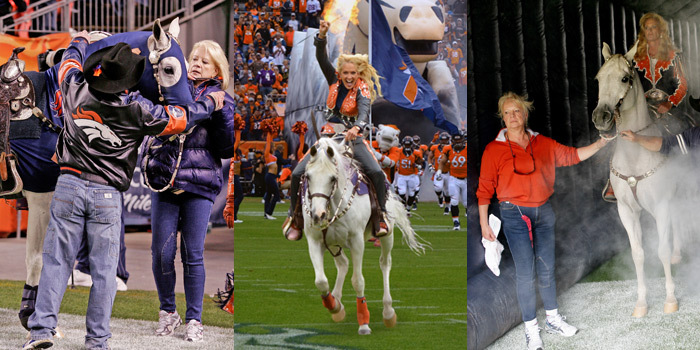 For that awe-inspiring Love of Thunder, we have owner Sharon Magness Blake to thank for the gift of reveling in 23 years of special mascot moments. On Sunday February 7, Thunder lead the Denver Broncos to victory in Superbowl 50!